Portland, Ore Starting September 15 through November 4, the Portland Japanese Garden is bringing a little bit of Gion Matsuri straight from Kyoto to the Pacific Northwest. 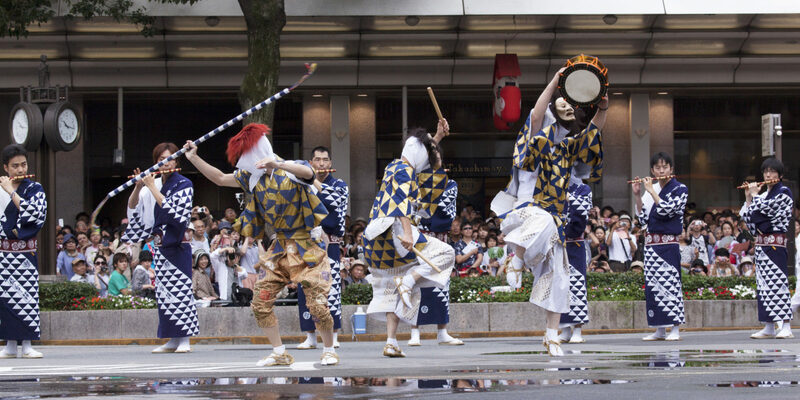 During opening weekend, September 15-16, the Garden’s celebration includes a troupe of 20 Gion Bayashi festival musicians from Kyoto, to perform the unique festival sounds on brass chimes and flutes that accompany the Naginata boko lead float in the procession. The performances will take place in the afternoons in the Garden’s Cultural Village. As part of the 6-week exhibition, the Ayagasa-Hoko float and accompanying costumes are being brought over from Kyoto and will be displayed in the Garden’s Pavilion Gallery. For those who have not witnessed the festival in person, it is a rare opportunity to see one of the original, authentic floats in person. The Ayagasa-Hoko has a lacquered cart that features a large parasol, atop of which rides a gilded cockerel, representing one of the gods that preside over festival. Additional photographs by Akira Nakata, one of Kyoto’s top photographers, will also be on view. About Portland Japanese Garden: Since it opened to the public in 1967, the Portland Japanese Garden has been immersing visitors in beautiful scenery while they experience the art and culture of Japan. Celebrated as one of the most authentic Japanese Gardens outside of Japan, the Portland Japanese Garden features eight separate garden styles on its 12-acre site.